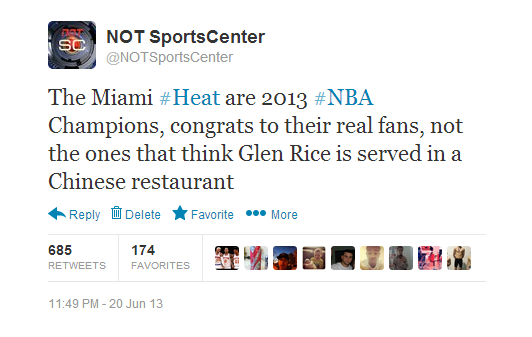 These tweets were in response to @NOTSportsCenter tweets on Saturday May 25 and Sunday May 26. Sorry dude, we’re not in to dolls. That’s creepy. 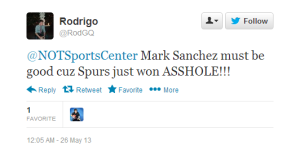 Next, we said the Spurs were playing like Mark Sanchez at the beginning of Game 3 (4-19, 8 turnovers in the first)…some Spur fans weren’t happy of course. We hate on everyone, so you can lump us in that group. You play like crap, you get mocked. You got out of it. NO. You stopped playing like Mark Sanchez and you won. There is no valid argument or equation that makes Mark Sanchez good, unless it’s an argument about sucking. He’s good at that. Frank Vogel probably did read them the definition of defense at halftime of Game 3, so yes. Yes it is what he said. And don’t tell your friends you were kidding, you know you weren’t. 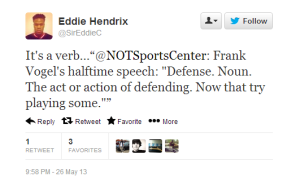 When you put the dictionary definition of Defense, the #GrammarCorrectionSquad is ready. But…. Uh no, it’s a noun. LeBron isn’t “defense” Paul George, he’s DEFENDING Paul George. 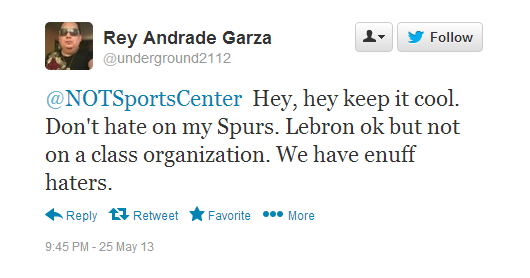 Although “LeBron is defense Paul George” has probably been said on twitter quite a bit. 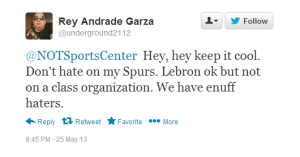 Why would “we count the Pacers out”? Maybe because they’re playing the best team and David Stern’s boy toy LeBron and got destroyed at home? Okay, we won’t count is out. By the way, your english us AWESOME. 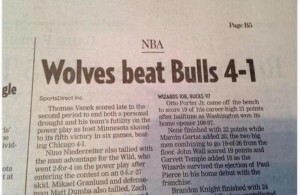 Right, because beating the HAWKS is remotely comparable to the Heat. 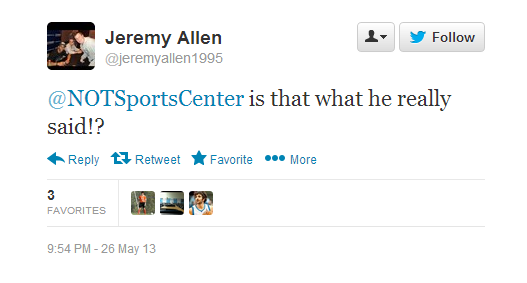 The Pacers beat the Bobcats too, wanna throw that in as well? Finally…well this is so good we’ll just turn it over to these 2. 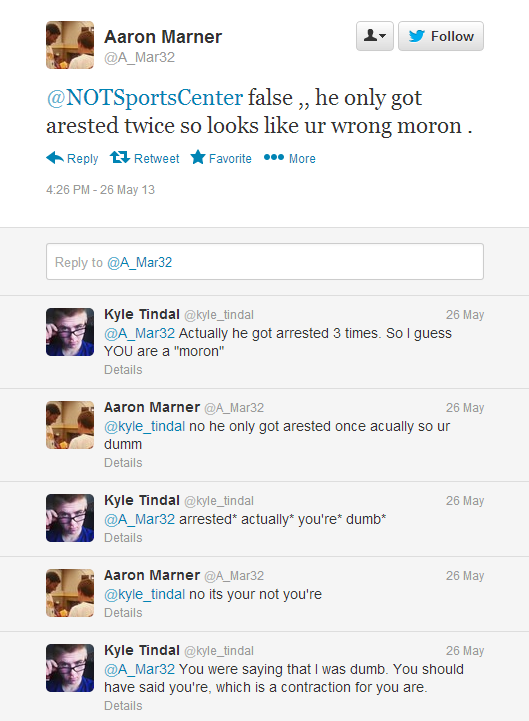 They argued about Titus Young and were basically wrong about everything. Make sure to read the whole thing. Hilarious. 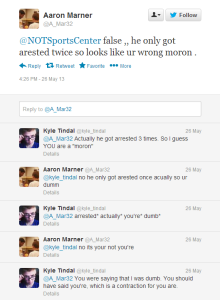 A conversation eligible for the Yours A Idiot hall of fame (if we had one…maybe we’ll have to start one).